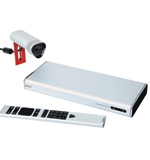 Polycom Group 310 video conferencing system with EagleEye Acoustic camera and remote control. Set up this system in a small meeting room or huddle space, and experience a full HD video conference with content sharing and high quality audio. Share content from your computer through the HDMI port or VGA port, or use the system’s People+Content IP application. You can also license the codec to support 1080p video, dual displays and additional formats. The included camera is also designed for smaller meeting spaces, with 2x digital zoom and a built-in microphone. Record and transmit video in 1920x1080 definition. Easily setup the conference call through the included remote control, and manage the system from the web interface. The Polycom Group 310 is incredibly intuitive, from setting up the components, to using the system and interacting with conferences.